Absorbent Pad Cleaning (also known as Bonnet Cleaning) – After the carpet is vacuumed, a chemical solution is sprayed onto it, usually via a pump sprayer or electric sprayer, and dwells on the carpet for adequate time. A rotary floor cleaner with an absorbent pad is then spun overtop of the carpet to collect the chemicals along with the soils from the carpet that have been loosened by the chemicals. Dry Cleaning or Dry Extraction – Solvents are mixed with a powder that is sprinkled over the carpet and worked into the fibers using a machine with rotating brushes. The powder is meant to absorb the soils in the carpet. The powder dwells in the carpet fibers for adequate time and then is vacuumed. Foam Extraction or Rotary Shampoo Cleaning – A cleaning solution is applied to the carpet fibers and then worked into a foam by using a machine with rotating brushes. After adequate dwell time, the foam is vacuumed, along with any soils that were suspended. 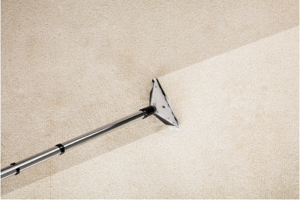 Hot Water Extraction (commonly known as Steam Cleaning) – Water and cleaning solution are heated and injected into the carpet where they loosen the soils and other substances in the carpet. The water, solution, and soils are all then extracted with strong suction. Many of these carpet cleaning methods work alright for light levels of soil and quick, cheap, surface cleaning. Customers who want a truly deep cleaning, however, should choose to have hot water extraction cleaning for their carpets. Hot water extraction is the cleaning method recommended by carpet manufacturers, and is the only cleaning method that will clean the entire length of the carpet fiber, coating the fibers in cleaning solution and extremely hot water, allowing these two ingredients to clean and sanitize the fibers, and then suctioning out the liquid, including all soils and bacteria, leaving behind soft and clean carpet that dries quickly. One of the reasons that makes First Coast Home Pros the best carpet cleaning company in Jacksonville, Ponte Vedra, Mandarin, and all along the beaches is that we specialize in hot water extraction and clean carpets thoroughly and efficiently. Our technicians are trained to identify any stains or problem areas in your carpet and give each area the attention it needs. We use the best equipment in the industry, which means equipment that can heat the water to the high temperatures needed and create powerful suction to be sure all liquid and soils are removed. First Coast Home Pros is the best professional carpet cleaning company Jacksonville FL customers call on.